DYMO is a company selling embossers, hand-held label makers, desktop label makers and other stuff that helps people organize and identify their home, office or worksite. 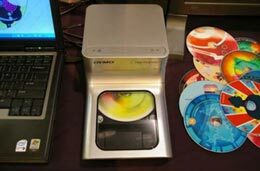 The DiscPainter uses an interesting DYMO’s technology named RadialPrint that prints directly onto the CD while it is spinning! The DiscPainter printer has three print quality modes from 600 dpi graphics in a minute, and 1200 dpi images in three minutes. The printer can also adjust ink density settings (nine points) for different disc surfaces like matte, glossy or color. One ink cartridge can print around 100 discs in a matte or glossy format. DiscPainter works with most MAC and PC design programs such as Adobe Photoshop, Illustrator, or In Design and has proprietary software to create and manipulate text, fonts, colors and graphics, with original and ready-made canvasses included. While Inkjet printers print directly onto inkjet printable discs using an accessory tray and the LightScribe technology uses special disc burners to “engrave” an image on special LightScribe discs, DYMO claims its DiscPainter offers the advantages of faster printing in full color. The DYMO’s site contains a tutorial video about DiscPainter showing how this device works. The DiscPainter comes packaged with USB 2.0 cable, AC power supply, three inkjet printable discs and a full-color ink cartridge and will be available from May 2008 for a retail price of US$449.00. This entry was posted on Monday, March 3rd, 2008 at 8:26 am	and is filed under gadget, inkjet, printer. "Connecting a Printer to Several Computers"
"How Dye-based Inks Are Different from Pigment Inks"